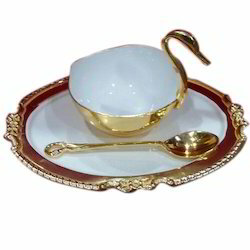 Rana Overseas manufacturer, supplier, exporter of Serving Plates Set, trays and Plates, We have wide range of Brass Plates, Steel Plates, Brass Thali sets, Steel Thali Sets, Brass Trays, Aluminium Trays etc. We are successfully meeting the varied requirements of our clients by providing the best quality range of Bhojan Thali Set. From the first among the best, we provide the first class quality of Exclusive Thali Set. Our customers can avail these Thali sets in various sizes and patterns. 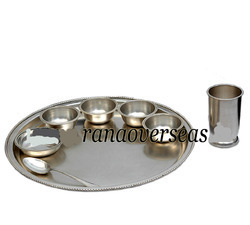 We provide a wide range of Thali Set. With the help of our skilled workforce, we manufacture these as per clients specific order requirements. Composition : Trianguler Thali Set Set of 2 Plates 13", Set of Bowls 4.5" 250 ml, Set of 2 Spoons 7.5"
We are dealing in 100%melamine crockery from Thailand. With our rich industry experience and knowledge, we are engaged in offering a wide range of Plastic Plate Set. Offered range is manufactured at our premises using quality tested plastic in compliance with industry quality standards. These Plastic Plate Set can be availed by our clients at market leading prices. Features: Light weight, perfect finish, Premium quality.